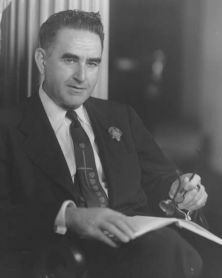 Governor, 1949-1953; United States Senator, 1954-1958; N.C. Commissioner of Agriculture, 1937-1948. Birthplace is nearby. Agricultural leader and champion of rural North Carolinians or, as his supporters were known, the “Branchhead Boys,” Willam Kerr Scott (1896-1958) inaugurated a new era of progressive reforms, chief among them the hard-surfacing of farm-to-market roads across the state. “The Squire of Haw River” was born in that Alamance County community on April 17, 1896, to Robert Walter Scott and the former Elizabeth Hughes. His father, known as “Farmer Bob,” was a leader of the Farmers’ Alliance and served on the State Commission of Agriculture and in both houses of the legislature. 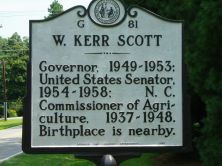 Kerr Scott, who completed a degree in agriculture at North Carolina State College in 1917, remained a farmer and dairyman with close ties to his home and church, Hawfields Presbyterian, all of his life. In 1919, on return from brief service as an artilleryman in World War I, Scott married Mary Elizabeth White. Their three children included Robert Walter Scott, governor of North Carolina from 1969 to 1973. 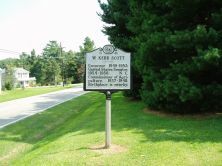 From 1920 to 1930 Kerr Scott worked as agricultural agent in Alamance County and from 1930 to 1933 served as master of the North Carolina State Grange. He was regional director of the Farm Debt Adjustment Program of the Resettlement Administration, with duties extending to seven southern states, from 1934 to 1936. In 1936 Scott fulfilled a promise made to his father by successfully running for state agriculture commissioner, unseating incumbent William A. Graham. As commissioner Scott was a leading proponent of rural electrification and led the successful fight to rid the state of Bangs disease among cattle. He forced manufacturers of feed and fertilizer to eliminate sawdust and sand from their products. With a political base among the state’s farmers, Scott met State Treasurer Charles Johnson, who had the backing of what remained of O. Max Gardner’s political machine, and liberal Raleigh attorney R. Mayne Albright in a field of six in the 1948 Democratic gubernatorial primary. In the runoff Scott defeated Johnson, ending almost fifty years of Democratic politics dominated first by the organization of Senator Furnifold Simmons and then by that of Gardner. Reformers, frustrated throughout the New Deal by the conservative, cautious approach of North Carolina governors, hailed the victory. In the fall Scott easily defeated Republican George Pritchard, becoming the state’s first farmer-governor since Elias Carr was elected in 1892. In his inaugural address Kerr Scott, who had charged in the campaign that over $100 million in surplus funds was “lying idle” in state banks, proposed investment of those monies and massive spending programs. Those proposals, which he labelled his “Go Forward” program, met resistance in the legislature but, with a series of radio addresses, Scott took his case to the people. In June 1949 voters approved referenda to issue $200 million in road bonds and $50 million in school bonds. Over four years the state paved more roads than had been paved up to 1949. The governor prodded the utilities commission to extend electricity and telephone service to rural areas. The 1949 legislature, on Scott’s recommendation, funded construction of deep water ports at Morehead City and Wilmington. Scott’s appointments included the first black member of the State Board of Education, Harold Trigg, and the first female Superior Court judge, Susie Sharp. In 1949 he appointed University of North Carolina President Frank Porter Graham to the U.S. Senate. In 1953 Scott, known for his bushy eyebrows, cigar, and red rose in his lapel, left Raleigh to return to his farm at Haw River. The following year he was elected to the U.S. Senate where he served on the Agriculture Committee and where he helped frame legislation to finance the interstate highway network. His death on April 16, 1958, left North Carolina, for the first time in history, with no living ex-governors.